One of our most charismatic birds, we think all would agree, is the Red-lored Parrot. Common throughout Panama, and at over a foot in length, this species is one of the largest parrots we encounter at the Canopy Family lodges. The Red-lored Parrot is well-named for its bright red forehead and lores (the space between the eyes and bill on a bird) which distinguish this large green parrot from other Amazona parrot species in Panama. It has a bluish tinge on the crown and nape feathers, and some subspecies have yellowish cheeks. It shows a red patch in the secondary flight feathers when in flight. It has a bicolored bill with a distinct black tip and pale base. The tail is tipped with yellow. Males and females have the same plumage. In Panama, the local subspecies lacks yellow in the cheeks! Red-lored Parrots are best seen early in the morning when they fly, usually in pairs, to their daily feeding areas, where they feed primarily on seeds and nuts, then again in the late afternoon when they fly to their evening roosts. Amazona parrots (also including the Mealy and Yellow-crowned parrots in Panama) fly with stiff, shallow, rapid wingbeats, distinguishing them in flight from some of the other species of parrots. They are vocal in flight, but usually silent during the day when feeding, and being primarily green, they blend in very nicely in the crowns of leafy trees. 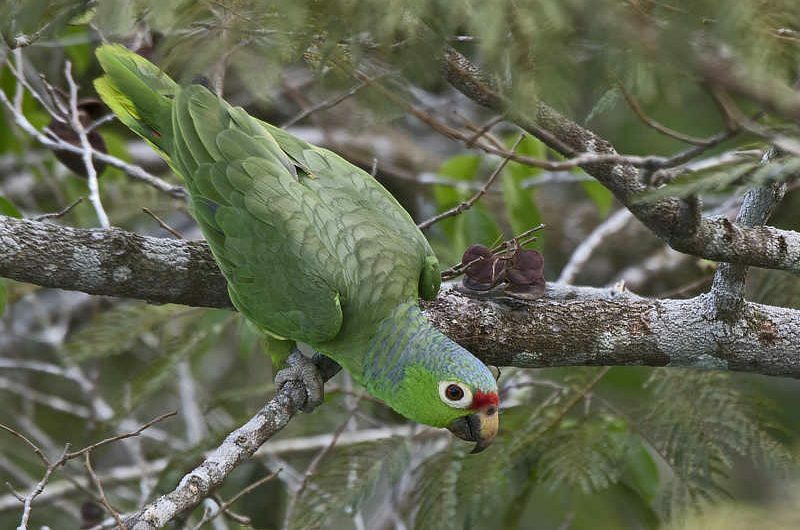 Red-lored Parrot calls are similar to the slightly larger Mealy Parrot, with loud, harsh flight calls but slightly higher pitched, and giving a distinct “crack-er-jack” call in the Canal area of Panama, not heard in other parts of its range – a local dialect! The Red-lored Parrot is found in the lowlands to 900 m elevation, and is able to inhabit somewhat degraded forest and watersides where Mealy Parrots do not. Large numbers gather at roosts, particularly during the non-breeding season. Pairs are together throughout the year. Like other parrots, they nest in tree hollows and cavities. The female lays 3-4 white eggs and incubates them for 26 days, and the chicks fledge at approximately 60 days old. The Red-lored Parrot has a wide range, from eastern Mexico to northwestern Venezuela and western Ecuador, and also has a very disjunct population in northwest Brazil, which could possibly be a separate species. In Panama, it is common throughout the entire country except in the western highlands and eastern Azuero peninsula, and can be seen commonly at all the Canopy Family lodges. Companion Birds: The Red-lored Parrot is fairly common in aviculture, where it is known as the Red-lored Amazon. Populations in Mexico and Venezuela have declined significantly due to illegal capture for the pet trade.